Hello my friends from around the world. The next email is not going to be fun as others. I received the attached mail from a father who lost his son to the conflict. You asked to know more about my country and I think that this should be part of this, even that it's not common. 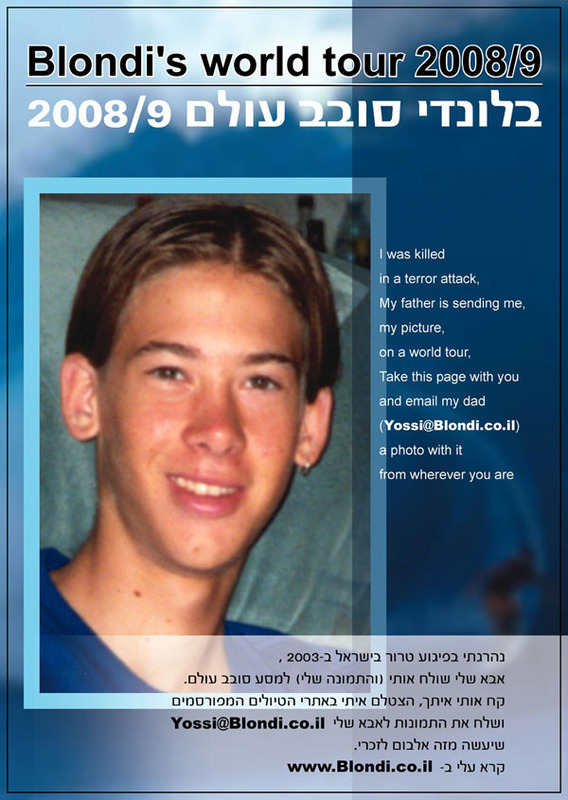 This person, Yossi is his name, tells the story of his son, Blondi, who died in 2003 by a suicide murderer. His son probably wanted to travel around the world after his military service, the same way I did, and probably would have met amazing people the same way I met you. His father asks if we can take his attached picture and take our picture with it in different places around the world, to give Blondi the travel he will never be able to have by himself. I thought the best I can do is asking all my international friends to take their picture with him. I promise my next Israeli email wouldn't be a sad one, but this is indeed part of our country.